For the seafood connoisseurs, mild flavor and flaky texture. Possibly the most desired fish in the world. Great baked, broiled, and smoked. Looking for a tender and juicy fish to serve your family? Try our fresh Pacific Halibut caught throughout the year to bring you the freshest halibut around. Pacific Halibut is one of the tastiest fresh seafood on the market and comes to you vacuumed sealed in 1 pound fillets. Make a quick and tasty dinner with our premium choice Pacific Halibut that will satisfy any seafood lover. Our Pacific Halibut fresh fillets allow you to serve your entire family a scrumptious meal or prepare an intimate dinner for two. What ever your dining wishes our Pacific Halibut fillets will appease everyone. As a fresh Halibut supplier seafoodinc ships fresh and frozen Halibut worldwide. 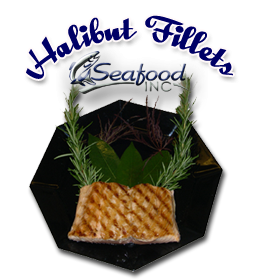 Seafood Inc is dedicated to superior quality of its frozen and fresh halibut.